Lucy A. DeRosa, 94, of Staten Island, NY, passed away peacefully at Seaview Nursing Home. She was born November 19, 1922 in Staten Island, NY, daughter of the late Nicholas & Lena DeDomenico. In addition to her parents, Lucy was preceded in death by her husband, George A. DeRosa in 1986 and her son, Nicholas M. DeRosa in 2009. Lucy loved watching the Yankees and the Giants play, as well as traveling to Atlantic City. She was actively involved as an Aide for PS44. She leaves to cherish her memory, her great great nephews, Matthew & Michael, she treated them like her own grandchildren. Plus many family and friends. She will be deeply missed. Calling hours will be held at Cherubini McInerney Funeral Home in Staten Island on Saturday and Sunday from 7-9pm. 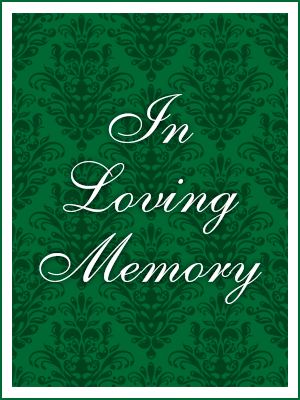 A Funeral Mass of Christian Burial will be held on Monday at 10:00am at Holy Family RC Church. Burial will follow at St. Peter’s Cemetery.